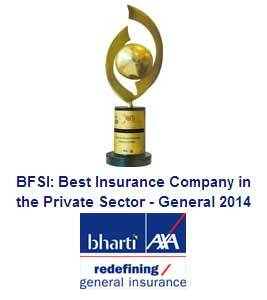 Bharti AXA General Insurance (GI) Company, one of the fastest growing multi-line general insurance companies in India, was awarded Best Insurance Company in the Private Sector – General, by the World HRD Congress at the ABP BFSI Awards, 2014. The award was presented at a ceremony held on 14th February at Mumbai. Bharti AXA General Insurance Company Ltd is a joint venture between Bharti Enterprises, a leading Indian business group and AXA, a world leader in financial protection. The joint venture company has a 74% stake from Bharti and 26% stake of the AXA Group. Presently the organization has cashless facilities in over 4300 network hospitals and over 1800 garages as well as 24/7 claims registration through multi-modal channels like e-mail and SMS. The organization commenced national operations in August 2008 and currently has 59 branch offices across the country. Bharti AXA General Insurance is the only Indian company in the life and general insurance category to have been nominated for and won the ‘Risk Manager of the Year’ award at the Asia Insurance Industry Awards 2011. The organization was also awarded the prestigious ‘Personal Lines Growth Leadership Award 2011’ at the India Insurance Awards 2011 and this won the ‘Best Product Innovation Award’ and ‘Commercial Lines Growth Leadership Award’ at India Insurance Awards 2012. It won the ‘Best Employer Brand’ award at the IPE BFSI Awards 2012 and ‘Claims Initiative of the Year’ award at Star of the Industry Awards 2012. It also won the Editor’s choice award for service innovation at Banking Frontier’s Finnoviti 2013. Further, it is also the first organization in the GI Industry to receive dual certifications of ISO 9001:2008 and ISO 27001:2005 within the first year of operations in 2009 and subsequently re-certified in 2012 for further 3 years.